Transporting your boat is a big undertaking. There are several factors that govern the transportation process, such as costs, the weight of the boat and current season. Instead of taking up the mantle of transporting the boat yourself, it is advisable to hire a reputable boat transportation services provider to do the job. To get you started, here are some useful tips to help you transport your boat hasslefree. Take a look. First up, you should secure all the damage prone components of your boat, such as the windshield (if it is a power boat), windows, cabin doors, and the electronic dashboard. It is better to ship all the electronic components of the boat separately, or transport them yourself. In addition, you must make sure that the boat is saddled securely on the trailer and tied with ropes to the trailer so that it doesn’t disengage. You must secure all the elements hanging from the hull and close shut all doors and dampers. In addition, empty your fuel tank, disconnect the batteries, and safely tie-up all electrical cables before transporting the boat. Taking measurements of your boat before transporting it is very important. There are three major measurements that you need to take – overall length (from the bow to the center of a stern), overall width (take the measurements from the widest points of the boat), and overall height (from the bottom of the boat to the highest irremovable part of the boat). Make sure that you include bow pulpits, outboard motor brackets, and swim platforms, for the overall length. Also, make sure that the radar arch is secured against the boat, in case you remove it prior to taking the measurements. 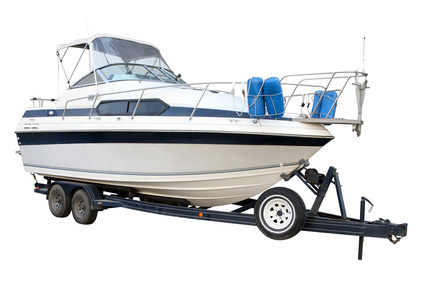 It is always advisable to hire a reputable boat transportation services provider. Professional transport services provider have the required set of tools, experience, and workforce to efficiently and safely ship your boat to the desired destination. They can also help with all the paperwork and secure your boat before transportation. This ensures there is the minimum risk of damage during transportation. You need to ascertain the capabilities of the service provider by asking specific questions, such as whether or not they have a forklift or travel lift, and whether or not they can shrink-wrap or cradle your boat, and have a service area to reassemble the radar arch. Request boat transportation cost estimates from multiple service providers. Reviewing price quotes from multiple boat transport service providers enables you to compare their services and make an informed decision based on factors such as the expected date of delivery, and the safety guidelines followed by the company. Transporting your boat across states is a demanding proposition. You need to thoroughly review every aspect of the shipping process before giving a nod to a specific provider. To negate your apprehensions about the safety of the boat while in transit, hire an experienced boat transport services provider that quotes reasonable transport costs that match service quality, such as EasyHaul. We provide a full range of boat transport services, whether domestic or international. If you are planning to ship a boat or any other vehicle, give us a call at 1(360) 597-9320.